The Cantong qi is the main text of Taoist Internal Alchemy (Neidan). In addition to Taoist masters and adepts, it has also attracted the attention of philosophers, cosmologists, poets, literati, calligraphers, philologists, and bibliophiles. No less than 38 commentaries written through the end of the 19th century are extant, and dozens of texts found in the Taoist Canon and elsewhere are related to it. The present book is the most complete guide available in any language to this vast literature. The book is divided into two main parts. Part 1 contains a catalogue of extant and lost commentaries, essays, and related texts, listing altogether about 150 works with details on their authors, editions, and reprints. Part 2 contains a survey of the textual tradition of the Cantong qi, focused on the composition and contents of about 40 major texts. A final index of authors, editors, titles, and editions facilitates the use of the book. 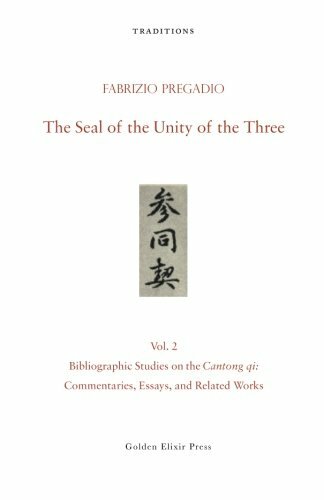 This book is a companion to the complete translation of the Cantong qi published by same author, entitled The Seal of the Unity of the Three: A Translation and Study of the Cantong qi, the Source of the Taoist Way of the Golden Elixir (Golden Elixir Press, 2011). Fabrizio Pregadio has taught at different universities in Italy, Germany, the United States, and Canada. He is the author of Great Clarity: Daoism and Alchemy in Early Medieval China (Stanford University Press, 2006) and the editor of The Encyclopedia of Taoism (Routledge, 2008). In addition to his scholarly activities, he publishes translations of original texts on Taoism and Taoist Internal Alchemy (Neidan) addressed to a wider audience. These translations, published by Golden Elixir Press, include the Cantong qi (Seal of the Unity of the Three); the Wuzhen pian (Awakening to Reality); the Ruyao jing (Mirror for Compounding the Medicine); the Yinfu jing (Scripture of the Hidden Accordance); and Cultivating the Tao, a work by the great Taoist master, Liu Yiming.